The Devils surprised last season on the strength of Taylor Hall’s MVP performance. He’ll need a similar performance this season, and more help from the rest of the cast, if New Jersey wants to start a mini playoff streak. Taylor Hall is your reigning Hart Trophy winner and his center, the delightful Nico Hischier, has just completed his first NHL season. If Hischier can continue his meteoric ascent – which, really, comes down to getting bigger and stronger, not a hard thing to do with the proper summer workout regimen – then the Swiss pivot will be a lot closer to Hall in points than he was last season. A return to health for Marcus Johansson and Brian Boyle makes New Jersey a lot harder to play against on any given night. Elsewhere up front, the Devils have nice talent bubbling up, from Jesper Bratt to NCAA champion Joey Anderson and speedy Michael McLeod. Competition is great when raising a team’s level, and New Jersey has depth there. A full year of Sami Vatanen will help the defense corps, while starting goalie Cory Schneider has the pedigree to bounce back from a lackluster 2017-18. Coach John Hynes hit on a winning formula and, along with GM Ray Shero, has instilled a culture where not long ago there had been a void. If all those factors come together, the Devils will get back to the playoffs, though winning a round is a tough assignment. A lot of things went right for New Jersey last year, and they all won’t break favorably again. The Devils tied Toronto for the most one-goal wins in 2017-18 despite being in the bottom half of the NHL when it came to puck possession. Hall’s season was incredible and he’s a top-tier winger, but what happens if Hischier contracts the sophomore slump? New Jersey doesn’t have a lot of proven scoring outside of Hall and Kyle Palmieri. The blueline looked iffy on paper last year, though rookie Will Butcher helped more than expected. Again, what if he regresses in Year 2? In net, Schneider really fought things, particularly in the second half when Hynes showed more confidence in backup Keith Kinkaid as the Devils clawed their way to a playoff spot. Kinkaid isn’t the type of goalie to give a team 60 starts, and if Schneider can’t regain his form, New Jersey is in trouble. We’ve seen this show with rebuilding teams before, with a surprise playoff berth followed by a crash back to earth. Consider the Devils on notice to be that franchise. Of course, missing the post-season and getting another high draft pick to pad out the list of prospects wouldn’t be the worst thing to happen. Is Schneider still capable of playing like a No. 1 netminder? Two seasons ago, questioning Schneider’s ability would have been tantamount to questioning whether water was still wet. Not only was Schneider the only thing keeping the Devils somewhat respectable during the first three seasons of his tenure in New Jersey, he was a legitimate Vezina Trophy candidate in 2015-16. He probably would have finished top three in voting were the award based on individual numbers than a mix of personal play and team success. He finished second in save percentage (.924), goals-against average (2.15) and tied for seventh in shutouts (four) that season. Schneider’s game has pulled a Thelma and Louise and driven right off a cliff in the two campaigns since, though. Injuries have, in all likelihood, played their part in his decline, but the precipitous drop in his numbers is still head-scratching. Since the start of the 2016-17 season, among the 31 goaltenders with at least 82 games played, Schneider ranks 28th in SP (.908), 27th in GAA (2.86), tied for 27th in shutouts (three) and is six games below the .500 mark. That he lost his job for a spell last season, and that Kinkaid got the start to open the post-season, is proof that confidence in Schneider’s game is waning. A few early slips and Schneider will find himself in the No. 2 role early, which is somewhere no one thought he would possibly be landing two years ago. THE HOCKEY NEWS’ PREDICTION: 6th in the Metropolitan Division. 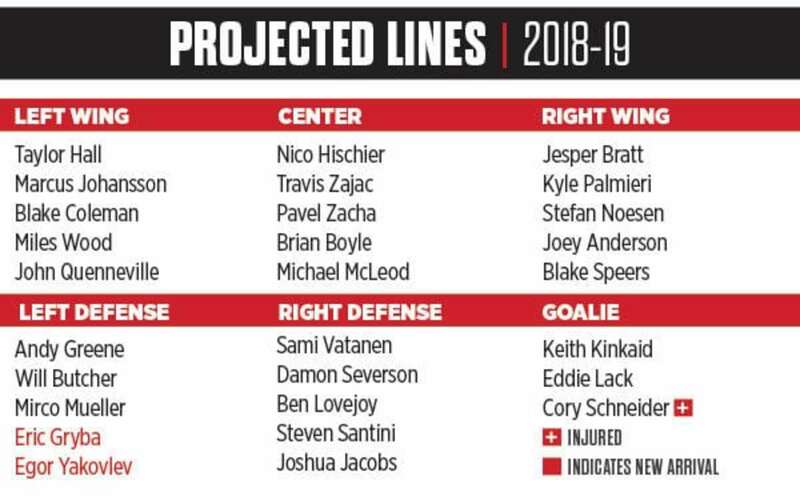 The Devils didn’t do much in the way of roster improvement this summer beyond a few minor adds. The blueline is still suspect and the offensive depth will be shallow beyond the established scorers if the kids take time to adjust. Add in questions in goal, and the Devils could be set to take a small step back.